When we talk about security for paying a contractor or supplier the first thing that often comes to mind is a mechanic’s lien. But mechanic’s liens aren’t the only method of securing payment on a construction project. Certain projects also have a “payment bond” available to unpaid subcontractors and suppliers. 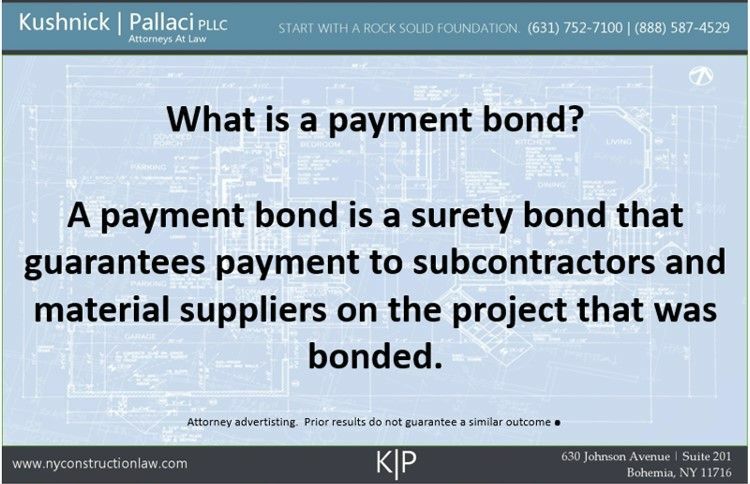 A payment bond a surety bond that guarantees the principal (usually a contractor) will pay all subcontractors and material suppliers on a construction project. If the principal does not pay, and there is no valid reason to not pay, then the surety is typically required to pay subject to the terms and conditions of the bond. Do all Construction Projects Have a Payment Bond? Unfortunately not all construction projects have payment bonds. In New York, most municipal (public) projects require payment bonds. The “Little Miller Act” found in Section 137 of the State Finance Law governs which municipal projects in New York will require a payment bond. For federal projects, the Miller Act controls and requires a payment bond on all projects that exceed $150,000 in value. Additionally, certain private construction projects may have a bond if one was required by the project owner. How do I make a claim on a payment bond? A claim on a payment bond must be submitted in accordance with the terms and conditions of the bond and any controlling law. In general, a claim is submitted by sending a written notice to the surety that issued the bond and notifying the surety that you have not been paid. Usually the surety will then require a “proof of claim” be submitted to support the claim under the bond. Submission of the claim under the bond is usually subject to time restrictions. Often, the surety must be put on notice of the claim within 60 days of the last performance on the project. 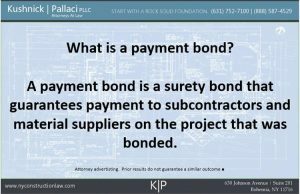 The attorneys as Kushnick Pallaci regularly handle submitting claims under a payment bond and, when necessary, litigating payment bond claims in state and federal court. To discuss your specific payment bond issue you can contact one of our construction attorneys here. This entry was posted in Construction Litigation, Payment Bond Claims and tagged Payment Bond by VTP. Bookmark the permalink.